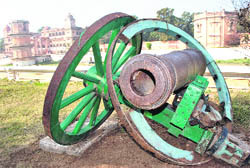 Guru Gobind Singh’s relics have been kept in a dingy room inside Qila Mubarak, which is already on the verge of collapse. These include a cloak given to Baba Triloka; manuscript (Bani), handwritten script of the guru; comb with hair and turban given to Syed Pir Budhu Shah of Sadhaura after the Battle of Bhangani in appreciation of his loyal services and three swords with inscriptions in Punjabi. 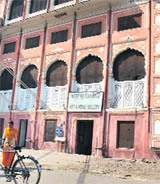 The medals (see below) have been kept in a museum inside Patiala’s Sheesh Mahal. These are inaccessible to tourists for the past several years for reasons best known to the authorities concerned. The museum also has a rare collection of chandeliers, which lie defunct, weaponry and photography. 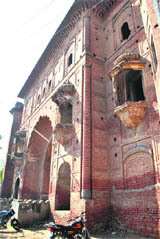 Asked why the tenth Guru’s belongings lied locked in a room inside Qila Muabarak, Channy said he was seeking an appointment from the Chief Minister and only then he could shift them to Virasat-E-Khalsa museum in Anandpur Sahib.